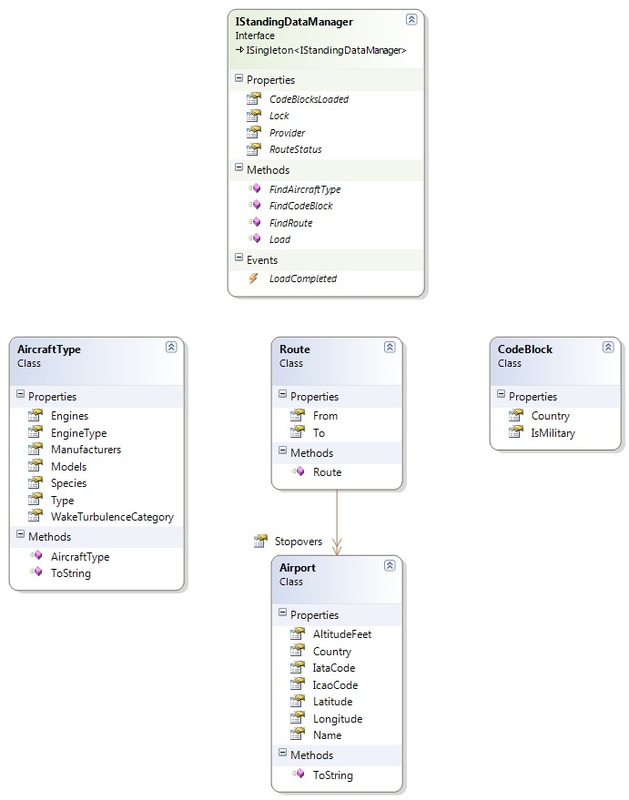 The namespace for all of the interfaces and objects associated with handling the standing data files. Describes an airline in the standing data files. Describes an airport in the standing data files. A DTO that carries information about a callsign and its route for instances of ICallsignRouteFetcher. The interface for objects that hold information about an assigned block of ICAO24 codes. Describes a flight number in the data files. Describes a route stored or inferred from the standing data files. The interface for the object that downloads updates to the data in the background once a day (configuration permitting). The interface for objects that abstract away the environment for IBackgroundDataDownloader. The interface for a singleton object that manages the fetching of routes for callsigns across many aircraft lists (or potentially anything that needs to find callsigns from routes). The interface for objects that manage standing data for the server. The interface for objects that abstract away the environment for IStandingDataManager. The interface for objects that can update the standing data maintenance files. The interface for objects that can abstract away the environment for IStandingDataUpdater. An enumeration of the placement of the engines on the aircraft, if known. An enumeration of the type of aircraft engine in use on the aircraft. An enumeration of the different species of flying machine described by ICAO8643. An enumeration of the different wake turbulence categories as used in ICAO8643. The standing data contains information about aircraft types, airport codes, airline codes and routes. The plugins would probably be most interested in the IStandingDataManager interface as this is the one that can perform lookups.